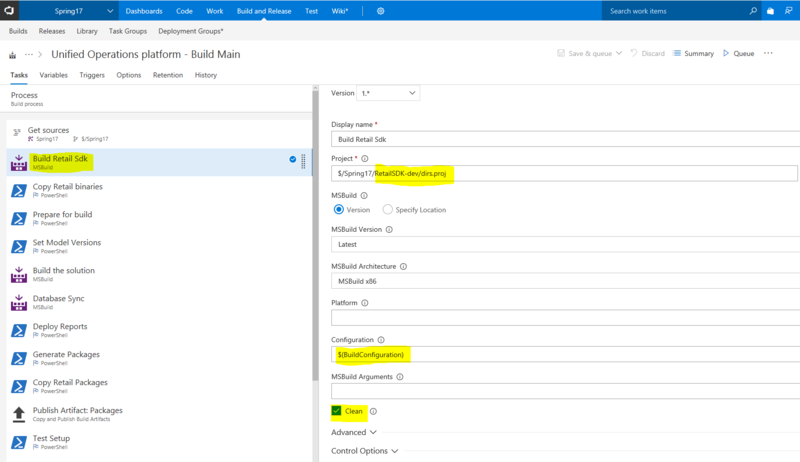 This article describes the steps for merging the build systems for both Dynamics 365 for Finance and Operations, and Dynamics 365 for Retail. The Lifecycle Services (LCS)-integrated build experience supports both code upgrades and new projects. The Retail SDK is a self-contained MSBuild-based build system. Many customizers want to make productive changes in both Microsoft Dynamics 365 for Finance and Operations and Retail components. 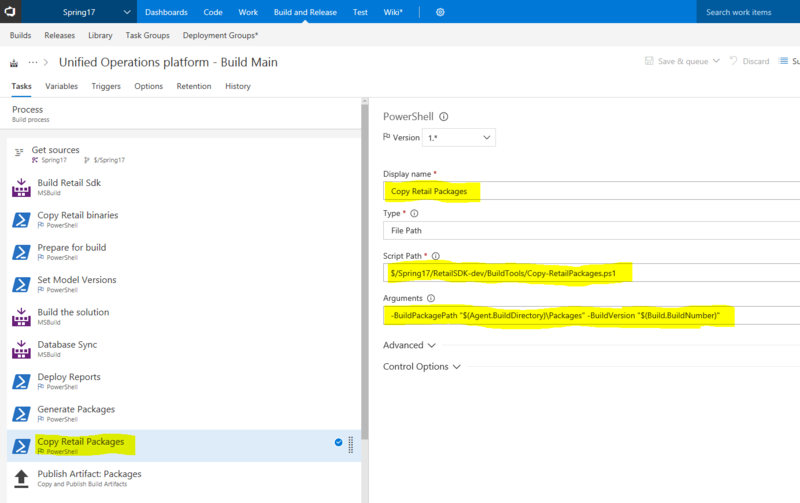 This article outlines the manual steps for merging both build systems using Azure DevOps. To get started, you must follow all the steps to get a full continuous build system up and running. For information, see Developer topology deployment with continuous build and test automation. 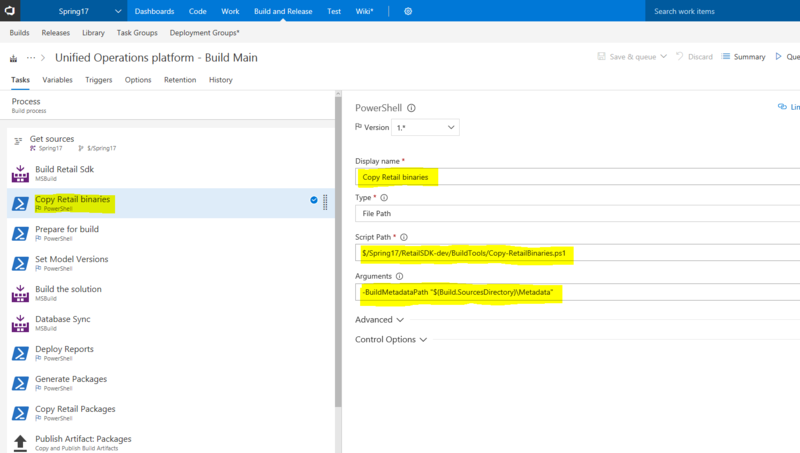 After deployment, you create the build definition and build steps. Build at least one time, so that you become familiar with it and are sure that you can build without errors. Then move to the next step. 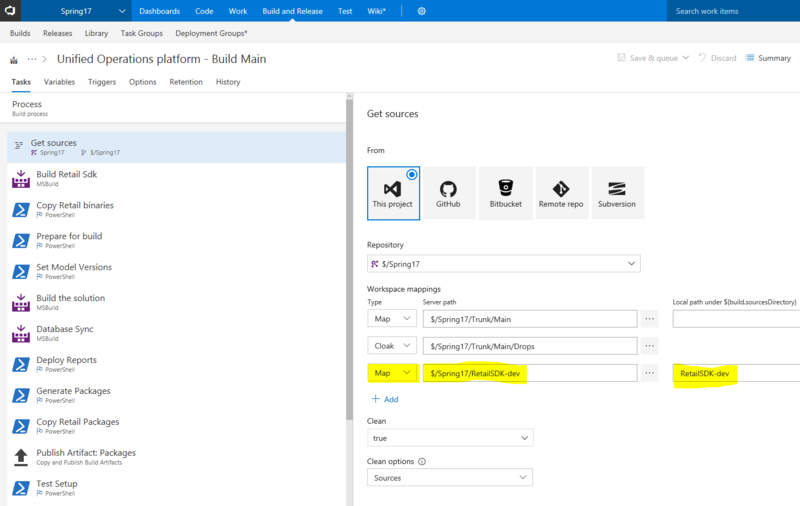 If you don't already have the Retail software development kit (SDK) in the same Microsoft Azure DevOps project, add it now. You will find the Retail SDK in any developer or build topology. Follow the branching documentation in Retail SDK overview. We recommend that you create your Retail SDK mirror and your Retail SDK customization branch at this time. After your Retail SDK customization branch is ready, and it has been submitted in the same Azure DevOps project as Retail, you can start. Open the Windows menu and type “Path”. The Edit the system environment variables will be available. In that menu, click Environment variables on the lower right. In the next window, under System variables, select Path and click Edit. Add an entry for the folder where you would like to store the nuget.exe file or store the nuget.exe file in a folder that is already listed. Add a new step at the beginning of the build pipeline, as shown in the following screen shot. This build step enables Microsoft to copy the latest built Retail binaries to the Retail bin folder, if Microsoft shares files/binaries. Make sure that you complete this step immediately after you add a build step for the Retail SDK, as described in the previous section. Make sure that this step occurs after the “PowerShell: Generate packages” step (see image below). Here are the arguments. Use a normal AXReference in your Retail project. Add the corresponding AXReference folder and the XML file inside it to Azure DevOps. Update the Copy-RetailBinaries.ps1 file with the appropriate file commands to get the binary file from the Retail SDK to the Retail bin folder. The Microsoft Windows PowerShell file includes a sample that copies the PricingEngine.dll file into the ApplicationSuite bin folder. Depending on the modules that you're building, the files and folders must be changed so that they are in a different location.